Commissioned work has become an important part of my practice. I very much enjoy the process and challenge of creating a piece of work that is just right for a specific person and place. Any of my designs can be adapted to create a textile artwork which is specific to your requirements. You can see many of my recent designs on my Gallery page. So, if you have seen a design that you particularly like, but would prefer it in different colours, with different fabrics, a different size and shape, please get in touch and we can discuss your requirements. I am also very happy to develop new designs. 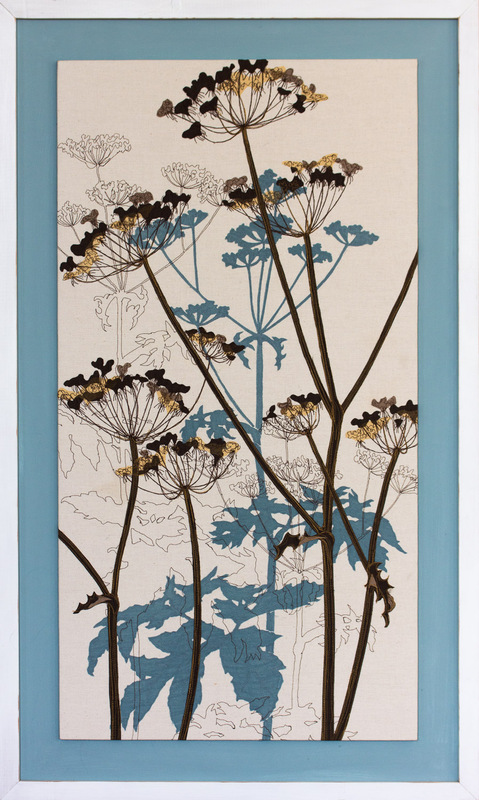 If you have a favourite plant or flower you would like depicted in a textile artwork, we can discuss this too. Often people will commission a piece of artwork because they have a specific place in mind to hang it. If this is the case, consider what size and shape the picture should be to suit that space. I find it useful to take a photo of the wall and draw on different frames to see what fits. Once I know what your preferred colour palette is, I will select an array of appropriate fabrics from my collection. We will then decide together which specific colours and fabrics to use. I will then produce a small sample piece using the selected fabrics, and a sketch of the overall design. Once these have been approved by you, I can proceed with the final piece. At this stage I will request a deposit payment of 40%. The total cost will already have been discussed. This will depend on the size of the piece, and the complexity of the design and the work involved. Artwork can be provided framed or unframed. I use a plain softwood frame in several widths, which can be painted to complement both the picture and where it is to hang. This can really make the whole finished piece really ‘belong’ in its surroundings. Alternatively, if you want to have your picture framed elsewhere, with more choices of framing materials, I can provide it to you stretched onto a board.